Here are just a few of the amazing projects linked up last week! Love it! Imperfectly Beautiful Redecorated her sideboard. Beautiful transformation! Mod Podge Rocks made adorable button art! Fantastic Flores Family turned a Mason Jar into a soap pump. I’ve seen these a lot lately and I love them! Run Mother, Run made over her TV stand. Huge improvement. I’m loving the glass knobs! Frilly Details added a touch of ORB to her candle holder and made it look like a million bucks. I love this decor. Finding Fabulous shared her porch revamp. One thing she did was paint her swing. I love that it hangs from the ceiling and now I’m going to copy her! Awesome features! Thanks so much for hosting hope you are having a great day!! Wow!! Love the button art! 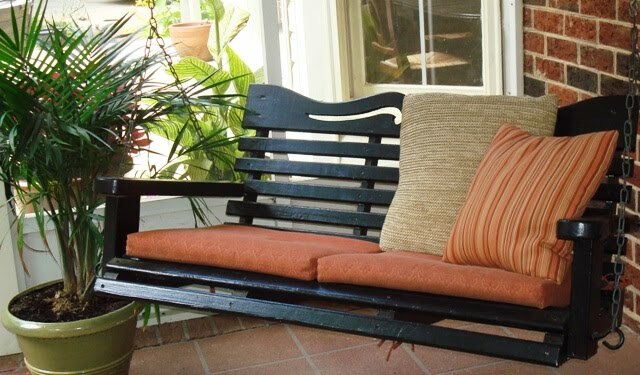 And the porch swing…and the TV stand…and…and…well darn…I love them all!! Also, thanks for TT, I am loving all of the ideas and so blessed to be a part of such a creative force of women on the internet. Thanks so much for hosting these parties. It’s such a great way to get seen by new peeps! I really appreciate it! Thanks so much for hosting this fun party. Great projects to admire! I love the side board and button art! Beautiful! Thanks for sharing! Thanks for hosting. Love all the great ideas. Thank you so much for hosting a great party. Thanks for featuring my project! Love your blog! Thanks for the great party! Your blog inspires me and I was so excited to Link up to your party. Im hosting my first giveaway tomorrow come check it out! Such cute ideas! I love the button art. My daughters would have fun doing this! Always sooo many cute ideas! Thanks for hosting. Thanks for hosting as always! Please come by and join my first ever link party Vintage Suitcase Friday! Please come by and join my first ever link party Vintage Suitcase Friday! Thanks so much for hosting…isn’t it fun?! I just found your blog tonight and I am going CRAZY over it. I wish I could comment about everything I love, but it would take forever. You do awesome work! Love your projects. You are inspiring me to be more creative! Thanks for blogging!